Porsche has several market prices in its current model lineup, but lets focus on the two top models for just a moment, ignoring the sedans and the SUVs. The 918 Spyder costs well over $800,000, and within spitting distance of $1,000,000 with the right options. The 911 Turbo S can be priced near $250,000 with the right boxes checked (admittedly, that number is easier to reach when configuring a Turbo S cabriolet). That’s an awful lot of financial space between the two, more than $500,000. Ferrari and McLaren are just two notable competitors that offer exciting cars priced well above Porsche 911 models and well below the 918. For years, Porsches have been lauded as “the affordable supercars” or “the everyday supercars” that compete (and defeat!) the likes of Ferrari, Lamborghini, etc. and often for less money. It would be great if Porsche decided to throw down the gauntlet in market segment between the Turbo S and the 918 with a Goldilocks model: One that’s not too expensive, not too “ordinary,” and priced juuuust right in that untapped $250,000-$750,000 price range. Holy Moses and Ferdinand’s Woolen Mittens, Batman! Look At That. Look. At. That. The fender flares, the air intakes at the front, the headlight frown, the poise – this car commands a presence with a purpose that Porsche captures with each sports car they design. But they haven’t made this one. Not yet, anyways. Nice, rough sketches with the basic shape, maybe a hint about a seat or a steering wheel, but a largely unknown interior. Those are Garcia’s original concept drawings, and then he took things much further. Signals, interior layouts, even the wretched plastic molding that restricts the view of engines in every modern car -- it’s all there. Garcia really let his imagination run absolutely wild when he envisioned this Stuttgart Ferrari fighter. That said, my one (and only!) complaint is that some design elements look more Italian than German: Ferrari always had the triple exhaust, the five-pointed star wheels and ridiculously large side intakes, not Porsche. You know what? I don’t care about those that much. Let’s look at the interior. Bespoke leather stitching all across the dash, a console layout inspired by the Carrera GT (and, subsequently, the Panamera and 991), ductwork for the climate control system, driver seat memory switches, mirror adjustments, this is all very well-sorted. A second (and final…. Promise!) complaint is the instrument panel again taking a more pedestrian gauge layout instead of using a variation of Porsche’s very traditional – and functional – tachometer centered design. Aside from that, this is beautiful and elegantly well made. Sorry, Ferrari, no plans to add an integrated entertainment system in the back; you’ll have to find some other way to pass the time looking at this side of the car. This image shows where Garcia’s inspiration latched onto the front fenders of a Carrera GT and the deep, striking aero cuts in the side are (comment if you’ve seen it anywhere else!) to be pulled right from the McLaren P1 (Project 12). I don’t see Porsche taking a design cue from anyone outside their offices, but I have to admit it makes this car look decidedly aggressive. The rear tail lights pull from a source closer to home – the light bar connecting the tail lights originated with type 964 911 Carrera 4/4S all-wheel drive models, and is installed on 4 and 4S models made today. 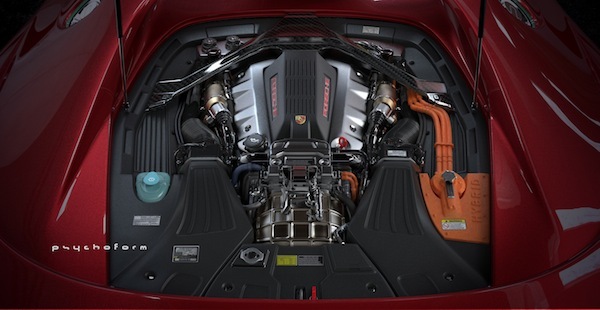 I also see a lot of Carrera GT and 918 visual cues in the engine cover as it wraps around each seat in the cockpit. It looks like a six-cylinder motor, but a couple cylinders may be hiding underneath a few covers and components. Carbon fiber braces like the Carrera GT and 918, this looks like a plausible branch in the Porsche family tree. It appears the plastic engine covers are integrated with the air intake system plumbing, but if the shape of the plastic is any indication of airflow direction, this engine is apparently pulling from the rear of the car, instead of those deep intakes we saw on the sides of the car. Oops! Of course, the plumbing could be totally different under these plastic sheaths, and, after all, none of this car actually exists, so I won’t try to analyze everything like it’s a tangible model! You may notice a fuel port on both sides of the car; I believe this is a concept plug-in hybrid, so perhaps one side is for gasoline, and the other hides an electrical plug. 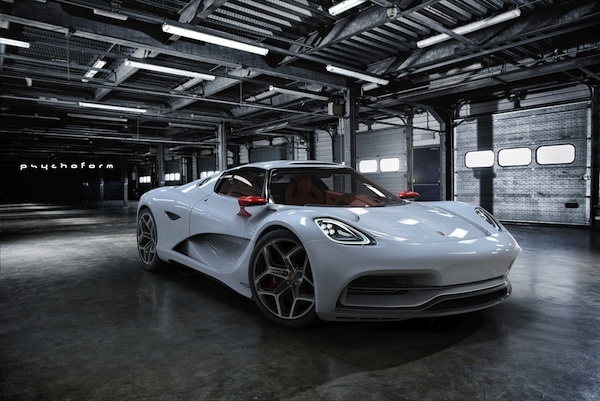 Garcia’s designs are immersive enough that I’m willing to overlook petty details, like a physical dipstick on a modern Porsche engine, or a washer fluid reservoir for the front windshield being mounted next to the transmission of a mid-engine car. Ah, there I go again, noticing logical inconsistencies! All ribbing aside, Garcia did a wonderful job capturing the essence of a spirited Porsche. 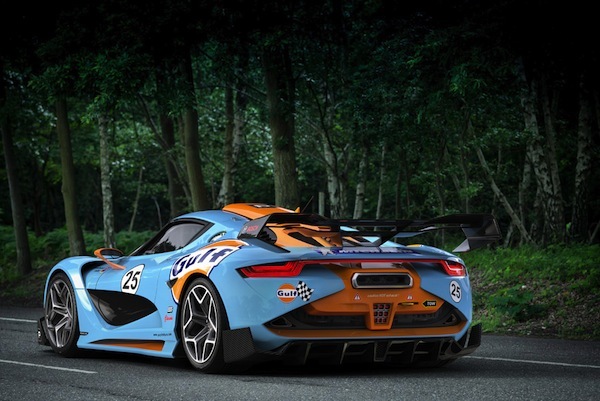 Not forgetting Porsche's motorsport heritage he created this version with Gulf livery, my favorite renderings. The gap between the driver and passenger bumps has been enclosed for additional air control, an aggressive rear spoiler and front ground effects work as been added, and look how cleanly that motorsport brake light has been added to the rear. 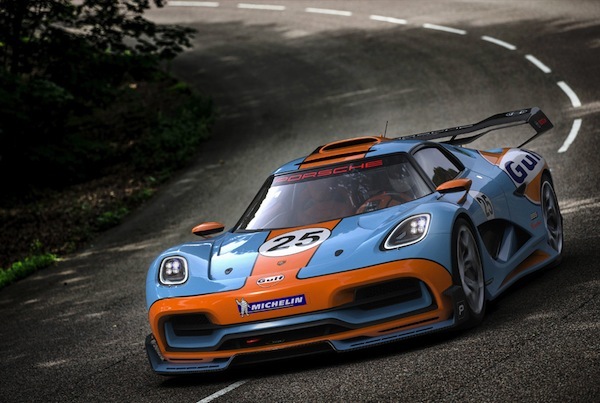 Garcia’s work shows he is clearly passionate about Porsche and motorsport, you can check out these and the other incredible concept renderings on his website. How great would it be to watch this 913 come to life and compete?? How great would it be to drive one – to own one? Isn’t it time for Porsche to put the likes of Ferrari, Lamborghini, and McLaren in their place (again!) with a car priced between the 911 Turbo S and the 918? They dominate the luxury sports car markets (60-90k and 100-200k), why not aim higher and find even more success? Will Porsche Ever Produce a Pickup Truck? A Total Of Only 7 Porsche Macans Recalled In The U.S. Subscribe to the first and only source of original Porsche-related content. That looks like the illicit offspring of a 918 and a Corvette. It’s funny, from different angles (especially in the renderings where it’s wearing a livery) I see lots of different influences. The front is clearly Porsche, it’s the back and side view I’m still having trouble with. The exterior design is very Ferrari-like, not a bad thing, except for the front end which is a bit boring. 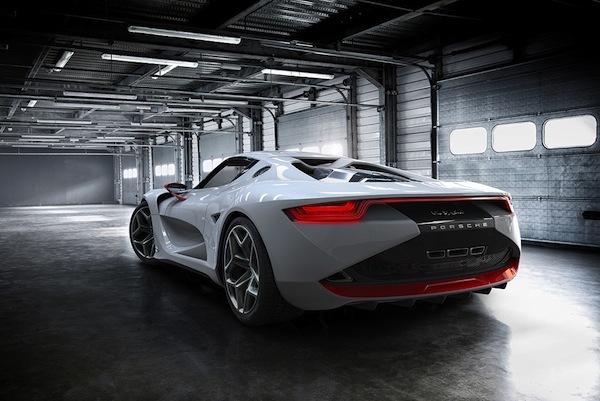 I see no reason for Porsche to build such a car. The market already offers numerous ultra-expensive exotic cars. I see Porsche design DNA everywhere on what appears to be a stunning design. Aston Martin, Lamborghini, McLaren, Ferrari, even Bentley shouldn’t have a lock on what’s a viable market segment. A business case could certainly be made for building it. And I have been a Ferrari guy for over 40 years,but that is truly exciting. In as much as this is but a graphic rendition of a Porsche 913 that ‘could have become’ I can’t help but raise my eyebrows at the blatant criticism of this write up. Give credit to where it is due and maybe commend Garcia for his vivid imagination and incredible artistic talent which might be fuel all on its own to water the seeds at Porsche HQ. Many of us enthusiasts passionate about Porsche and cars in general would rather enjoy a bit of uplifting and positive banter as there are many ways to convey one’s opinions. However, I’m now inclined to think that maybe you can do better Andrew Granieri and show us one of your own illustrations. I really do think that this car is magnificent, I do love almost the whole design. I can’t wait to see this car beat ferraris everywhere. Special Offers: Save on quality tires with these manufacturer's promotions available from Tire Rack. ATTENTION PORSCHE OWNERS AND FANS! Get access to exclusive Porsche related content, contests and DIYs. Receive unique offers directly from Porsche. Get our weekly newsletter with original and entertaining Porsche related content. Exclusive discounts on Porsche related parts and products.